As it turns out, I do belong to other groups on Facebook than just the geomancy one I admin, and just like in that group, many of the discussions in other groups to which I belong are equally as fascinating and helpful. One such group, the PGM Study & Practice Group, is focused on (mirabile dictu!) the study and practice of rituals and texts from the Greek Magical Papyri (or PGM, as many of my readers know). I’ve shared some of my works and joined in some conversations there from time to time, and I find it a helpful resource to belong to. PGM XIII, the Eighth and Tenth Hidden Books of Moses, uses an interesting device. 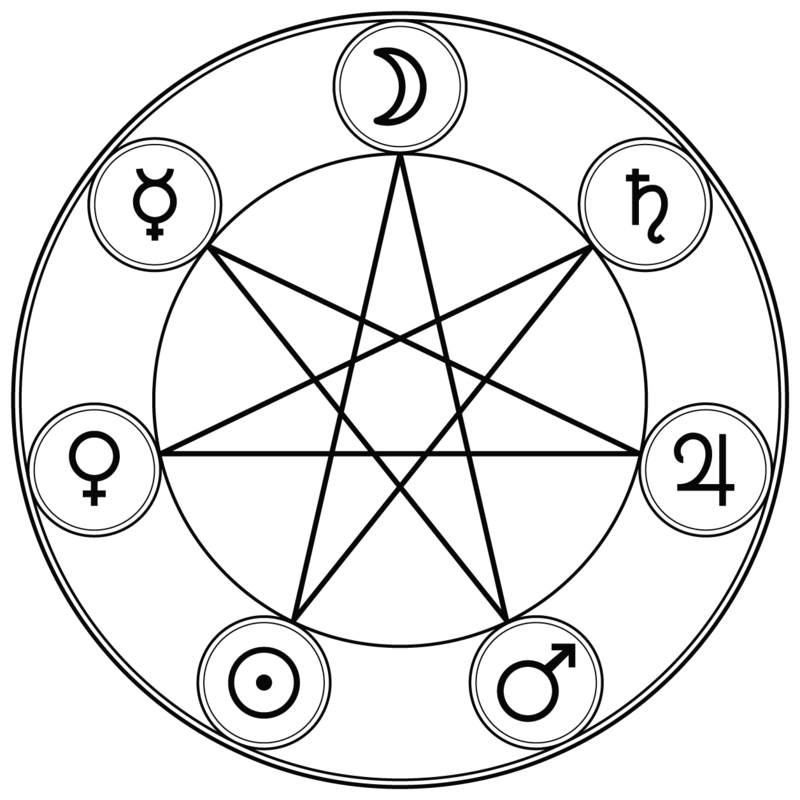 Before the various spells of PGM XIII.1—343 and at the end of PGM 646—734, we’re given “the technique of determining which god is ruler of the celestial pole” using “The Seven-Zoned” method. If the day is Sunday (day of Hēlios), the ruler is Selēnē. If the day is Monday (day of Selēnē), the ruler is Hermēs. If the day is Tuesday (day of Arēs), the ruler is Aphroditē. If the day is Wednesday (day of Hermēs), the ruler is Hēlios. If the day is Thursday (day of Zeus), the ruler is Arēs. If the day is Friday (day of Aphroditē), the ruler is Zeus. If the day is Saturday (day of Kronos), the ruler is Kronos. In other words, however many days have elapsed in the week since Sunday, the further up in the celestial spheres you go. As Sunday marks the beginning of the week, so too does Selēne mark the first celestial sphere; as Saturday marks the end of the week, so too does Kronos mark the last celestial sphere. My question is: what is this for? The “celestial pole” is, almost certainly, the pole around which the Earth and all its heavens whirl around, commonly recognized to be Polaris, the North Star, and tail of Ursa Maior. However, PGM XIII doesn’t refer to a way of invoking or referring to the ruler of the pole, just that there apparently is one. In fact, nowhere else in the PGM is the word “pole” used in conjunction with planetary rulers; the only such thing I might be able to even tangentially relate to it is in PGM IV.930—1114, where it calls upon a form of Horus Harpocratēs in a conjuration of sorts by calling upon “you who are seated within the seven poles ΑΕΗΙΟΥΩ”, but this seems unrelated and more about the seven supports of the heavens (cf. PGM V.213—303, “The pole [of the sky] will be brought down…”). PGM XIII.1—343 does mention that the student should “learn who is the ruler of that day” along with the “[names of the] gods of the hours, then those set over the weeks”, but this again appears to be something different, like a different god for each day of the year. So what are we actually recognizing by this “ruler of the pole” method? Are we saying that the North Star, and thus the immortal gate of heaven itself through which we ascend and address the gods, has a planetary affinity that shifts from day to day in a way separate from the planetary rulers of the day? Are we saying that the usual weekday reckoning of the planetary ruler of the day is a blind for a more magical, more woogity kind of planetary rulership of the days? Or is this referring to something we just don’t have extant in the texts anymore? Would you attach any significance to the fact that Saturn is the ruler of the pole as well as of the day on Saturday? Unfortunately, my attempt at starting a discussion just garnered a lot of likes and not a lot of comments. So, let me explain what little I understand and think of this particular aspect of this particular segment of the PGM. Basically, PGM XIII gives us a table like the following that compares the ruler of any day of the week as we’d normally consider it to the ruler of the Pole on that given day. No matter what the planetary ruler of the day is “in the Greek reckoning”, which is the system we’re most commonly used to in the West based on the planet that rules the first hour of the day starting at sunrise, PGM XIII says instead to recognize the planet that rules over the Pole according to the “Seven-Zoned” (also called “The Monad of Moses” in PGM XIII.646—734). The idea behind this organization appears to be that, as the week gets “older” and later, starting from Sunday all the way to Saturday, the Ruler of the Pole on that day gets “older” and higher in the heavens, starting with the Moon and going all the way until Saturn. Thus, on the first day of the week (Sunday), the Ruler of the Pole is the first closest heaven (the Moon); on the second day (Moon), the second heaven (Mercury); and so forth. 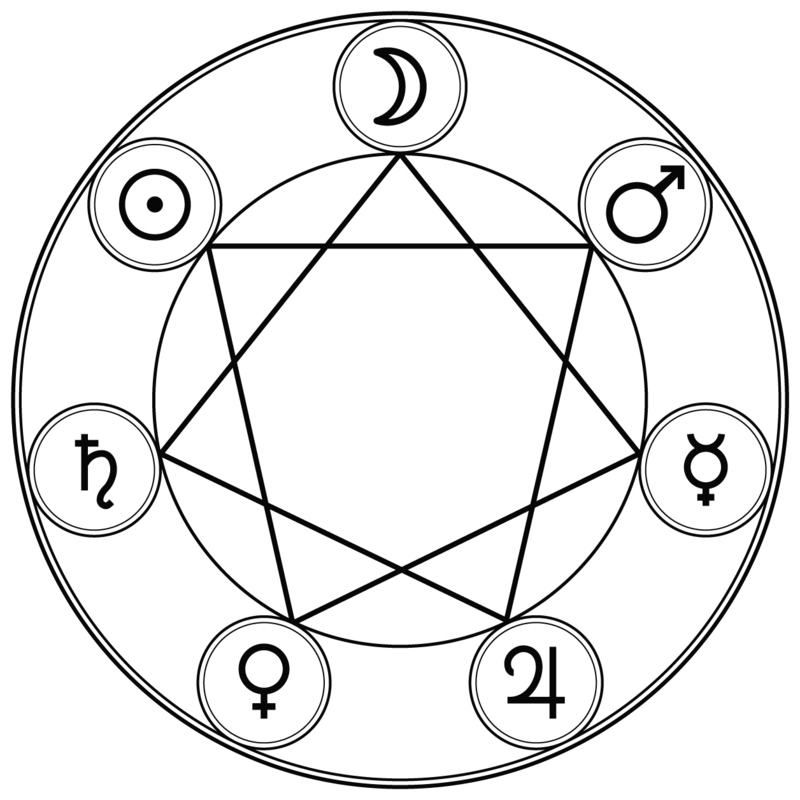 It’s not a matter of picking, like, the midnight planetary hour on each day, as the order of the planets in the Seven-Zoned method doesn’t fit that result. Plus, it might be significant that the only planet that overlaps its Pole Ruler day with its own weekday is Saturn. Here, if we start with Moon at the top and go around the circle clockwise, we get the order of the planets in the days of the week (Moon, Mars, Mercury, &c.), and if we follow the heptagram clockwise around starting from the Moon, we get the order of the planets ascending through the heavens (Moon, Mercury, Venus, &c.). What we basically end up with is the exact inverse arrangement as before, we’re just flipping the arrangement around. It might be argued that the author of PGM XIII considered the arrangement of planets for the days of the week to be a blind or corruption of a true order, that of the heavens, and by applying the same function that transformed the heavenly arrangement into the weekday arrangement just in reverse, we end up with a corrected, ideal, true order of the planets (kind of like the difference between the Earlier Heaven and Later Heaven sequences of the Ba Gua). In fact, that comparison to the Earlier Heaven and Later Heaven sequences of the Ba Gua might not be a bad parallel. If we consider the usual modus operandi of a magician of the PGM, if they’re not outright apotheotizing themselves into God, then they’re often initiating themselves to be their equals as, indeed, we’re doing in the rituals of PGM XIII. Aiōn, which is basically the divinity being appealed to in this part of the PGM, is considered an eternal god of time, but who’s to say what “time” looks like to such an entity? Our methods of reckoning time down here on Earth may not really apply “up there”, where another system entirely might be used. In other words, the different arrangements of the planets apply on different scales of the cosmos: the weekday arrangement of planetary rulers of the day functions on a microcosmic, human level, while the celestial arrangement of the planets functions on a macrocosmic, divine level. If (and this is a huge “if”) the author of PGM XIII was thinking in this way, then we’d want to appeal, entreat, and approach the gods on their own temporal terms rather than using our own human and worldly systems of planetary time-keeping. It’s an idea, I suppose, but I have nothing to back it up. I call on you, who are greater than all, the creator of all, you, the self-begotten, who see all and are not seen. For you gave Hēlios the glory and all the power, Selēnē the privilege to wax and wane and have fixed courses, yet you took nothing from the earlier-born darkness, but apportioned all things that they should be equal. For when you appeared, both Order arose and Light appeared. All things are subject to you, whose true form none of the gods can see, who change into all forms. You are invisible, Aiōn of Aiōns. I call on you, the creator of all, who are greater than all, you, the self-begotten god, who see all hear all and and are not seen. For you gave Hēlios the glory and the power, Selēnē the privilege to wax and wane and have fixed courses, yet you took nothing from the earlier-born darkness, but assigned them equality [with it]. For when you appeared, both Order arose and Light appeared, and all things were arranged by you. Therefore all things are also subject to you, whose true form none of the gods can see, who take different forms in [different] visions, Aiōn of Aiōns. Ritual practice from lines PGM XIII.114ff and again from PGM XIII.671ff. Though the use of a god of a day in this context might refer to one of the gods of the individual 365 days of the year, the specific phrasing leads me to believe it’s discussing the Ruler of the Pole of the day. Accordingly, as I said before, when you have purified yourself in advance [through the last seven days] while the Moon is waning, at the dark of the Moon begin sleeping on the ground on a pallet of rushes. Rising at dawn, greet Hēlios through seven days, each day saying first the [names of the] gods of the hours, then those set over the weeks. Also [each day], learning who is the ruler of that day, keep after him, saying “Lord, on such-and-such a day, I am calling the god to the sacred sacrifices”—doing so until the eighth day. Accordingly, as I have said before, when you have purified yourself in advance [through the last] seven days while the Moon is waning, at the dark of the Moon begin sleeping on the ground. Rising at dawn, greet the Sun through seven days, each day saying first the [names of the] gods of the hours, then those set over the weeks. Also [each day], learning who is the ruler of that day, keep after him, saying “Lord, on such-and-such a day I am calling the god to the sacred sacrifices”—doing so until the eighth day. Sacrifice protocol from PGM XIII.376ff. However, despite being a “ruler of the day in some sense”, what’s being referred to here probably refers instead to a ruler of one of the 365 days of the year, especially given its use along with gods of the hours, each with their own compulsive or restraining formula that we see traces of later in the Hygromanteia tradition. This is different than the juxtaposition of the “ruler of that day” from the above section, because it’s separated from the gods of the hours which are bundled with the gods of the weeks. The tasting of the victims is done [in] this way: When you are ready to taste them, sacrifice the rooster, so that [the god] may receive lots of spirit, and at the point of tasting, call on the god of the hour and him of the day, so that you may have sponsorship from them. For if you do not invoke them, they will not hear you, as being uninitiated. Now you will find [the names of] the gods of the hours and those of the days, and the compulsive formula for each of them in the Key of Moses, for he set them out one by one. This is basically all I can find in PGM XIII about the Ruler of the Pole, so as important as it might be for the text to point out how to determine the Ruler of the Pole, it’s apparently not that important except in how to address maybe one or two prayers and how to consider the temporal qualities of Aiōn on a day-to-day basis. None of these few uses, most of which are limited to just references to Aiōn as being a generic ruler (or a sort of hyperstasis of the individual planets, a sort of planet-behind-the-planets or the very Platonic Idea of Planet itself? ), give much of a hint of what we’re doing by invoking the Ruler of the Pole. Let’s back up a bit, I suppose. What, exactly, is the “Pole” being ruled over? There are two possible candidates for this: the ecliptic pole (the pole of the planet of the ecliptic, the orbital path of the Sun as viewed from the Earth) and the axial pole (the pole around which the Earth itself rotates on a daily basis). Though these two poles are similar, they are not identical; after all, the ecliptic is tilted slightly to the rotation of the Earth, which is why we have seasons. The axial pole of the Earth is basically the North Star, Polaris, which is the tail of Ursa Minor, or the Litte Dipper. On the other hand, the ecliptic pole of the Earth, along with all the other planets in the Solar System, lies further off in the nearby constellation of Draco. This was the point of the only small conversation that my post in the Facebook group started, mostly by my good colleague Freeman Presson. Freeman had the idea that, in a sense, every planet is conjunct the Pole by longitude in the same sense that, if you yourself are standing at the North Pole on Earth, any direction you face or travel will be south. Because of this, every planet could be seen as being eternally in communion with the Pole, even if they’re separated by latitude. However, someone else popped in to say that that’s not quite right, and that the pole of the ecliptic is not the same as the pole of the axial rotation of the Earth, and the two don’t really line up that well here. It was something to consider at least, but it doesn’t really get us much of anywhere. PGM IV.1323—1330 (“Another [Bear charm]”): ΚΟΜΦΘΟ ΚΟΜΑΣΙΘ ΚΟΜΝΟΥΝ, you who shook and shake the world, you who have swallowed the ever-living serpent and daily raise the disk of the Sun and of the Moon, you whose name is ΙΘΙΟΩ ΗΙ ΑΡΒΑΘΙΑΩ Η, send up to me, NN., at night the daimon of this night to reveal to me concerning the NN. matter. There are even some texts that give Thoth descriptions and praises in similar patterns and wordings to Akephalos, the Headless One of the Headless Rite. While I’m not suggesting that Thoth is the Ruler of the Pole or the North Star here, I am suggesting that many of the same qualities of a pantokrator/cosmocrator/all-ruler god transfer over based on similar ideas and notions. In other words, I’m definitely freestyling my correspondences and connections here, but rather than saying “X is Y”, I’m saying that “X is like Y”. ΣΑΧΜΟΥ ΟΖΟΖΟ, you the one who thunders, the one who shakes the heaven and the earth, the one who has swallowed the Serpent, hour by hour raising the disk of the Sun and surrounding the Moon, ΧΩΝΣΟΥ ΟΧΧΑ ΕΝΣΟΥ Ο ΒΙΒΕΡΟΗΣΟΣ. 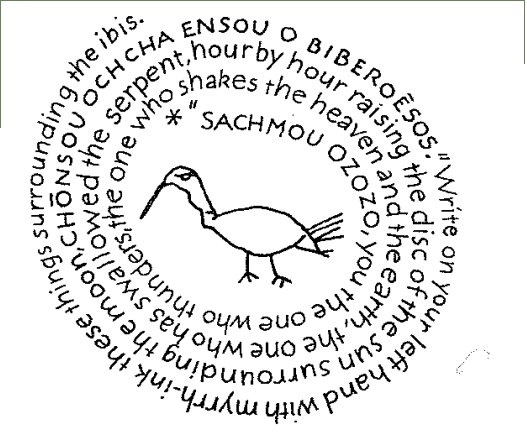 Write on your left hand with myrrh ink these things surrounding the ibis. Similar incantations also exist in PGM VII.359—369 (“Request for a dream oracle”). PGM VIII.1—63, however, includes a neat little tidbit: an aspect of Hermēs called upon for a binding love spell, but the aspect of which is given the description “in the north you have the form of a serpent”. Betz notes that this refers to the deity Uto or Wadjet, who is often found associated with the north. This whole “conquering” or “swallowing of the serpent” could also refer, historically, to the slow shift of the North Star to Polaris in Ursa Minor from Thuban, α Draconis, from some two- to three-thousand years prior. It’s an idea, I suppose. This is fascinating, but we’re not where we need just yet to figure out what the Rulers of the Pole are or what they do. We know that the Pole being ruled over has something to do with Polaris and the constellations of Ursa Maior and Ursa Minor, but that’s about it; we’re not seeing anything in PGM XIII or the Bear charms that are giving us a hint about these specific “rulers of the pole”. But there are other hints in the PGM and from the classical world that can tip us off in the right direction; we’ll handle that in the next post. Behold, a new geomancy group! Recently, my online friend and increasingly-awesome cohort in wine, magic, and divination and I were talking about Facebook on Facebook (there’s a “yo dawg” joke here somewhere). Long story short, we agreed it’d be awesome to start a Facebook group for traditional divinatory geomancy, so we did just that. You can find the link here, which you should totally click on and join, assuming you have a Facebook account and are also interested in geomancy. Yours truly, after all, is an admin of the group, and would so love to see you start a new conversation on an old art. Of course, the original geomancy mailing list, the Yahoo! group Geomantic Campus is still alive and kicking, and if you haven’t joined there yet, you should, assuming you have a Y! account and are also interested in geomancy. There’s also the Astrogem Geomancy Facebook group, for those of you who practice Les Cross’ innovative method of modern geomancy (which I’ve reviewed here). And then there’s also my own geomancy posts you might read and ask questions on. The power is yours!